I didn't get much knitting done this weekend. We had rain most of the weekend so I curled up and read Brisingr (loved it!). Saturday was pretty much spent in pajamas so my personal uselessness level was pretty high. What I am knitting on is the second Mountain Stream sock from the Water - Elements Sock Collection III. I got both of the Raindrops on the Window socks finished before starting the Mountain Stream sock, but now I have to finish that pair up. 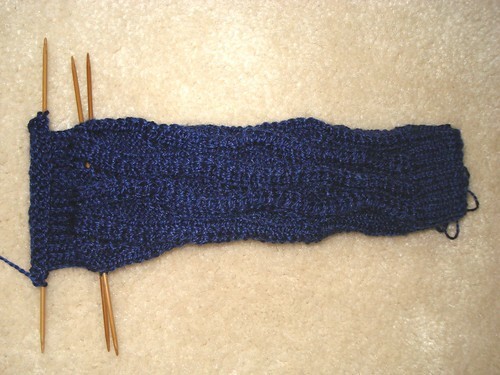 At this point I'm almost through with the heel flap and I hope to finish this sock today. I've also got to find something to feed the blog tomorrow since I'm fixing to start some stealth knitting for a pattern commission I got last week. Maybe I'll have a chance to get started on the fronts of Juno. I've almost finished the back of Juno. I'm at the point now where I'll start the shoulder and back neck shaping. I always think it's funny to look at ribbed pieces of knitting - they look so long and skinny because the ribbing pulls them in. As I was measuring for the length, I spread the piece out to what the width will be when I block it because when you open up ribbing, it will shorten a bit lengthwise. Just something to keep in mind for this or any other garment with lots of ribbing on it. There was a comment the other day from someone who loved the Juno design but it wasn't written in her size and she wasn't sure she wanted to commit to making adjustments. I honestly think this would be an easy design to change sizes on. If you look at the sweater, it's basically a 2 x 2 ribbed cardigan with a V neck and set in sleeves. It's meant to fit with very little ease. (I'm making the size for a person with a 34 inch bust and the finished garment is only supposed to have 1-1/2 inches of positive ease at that size.) The thing that makes Juno interesting is the cabled collar - and if you look at the pattern, you see that it's just knit to fit the neckline (there are surprisingly few directions for the collar). My theory is that you could find a yarn that gets you the same gauge as the pattern (4 stitches per inch) and use it in any generic V neck cardi pattern. The Knitter's Handy Book Of Sweater Patterns would be a great place to start. You might have to tweak the numbers a bit for your ribbing (a 2 x 2 rib is a 4 stitch repeat + 2), but you could knit it in a size pretty close to your actual measurements (I would think that you could go up to 3 inches of positive ease if that makes you feel more comfortable than 1-1/2, because the ribs are going to draw in some too). 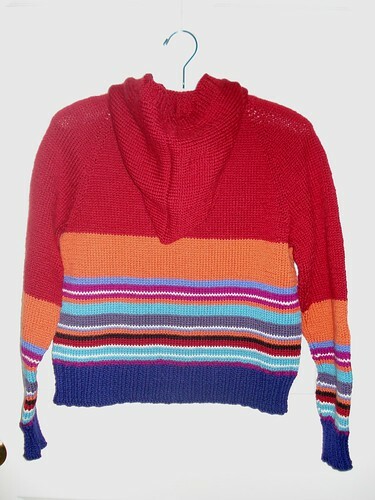 Then use the Juno pattern for the collar and knit it to fit your own sweater. Thanks for all the complements on my vest yesterday! There was a question about the size. The only size I know about is the one I knit and according to the pattern this size will fit up to a 38 inch bust. Since the fronts overlap, you just adjust the overlap more or less depending on your front porch situation (in the Department of Too Much Information, my own front porch is 33 inches, so this gives me plenty of room). If you need a larger size AND you want to add 10 stitches to the cast on, you might contact Colorsong and see if you can just buy 2 skeins of the Fleece Artist Scotia Silk and buy the pattern by itself instead of in a kit. 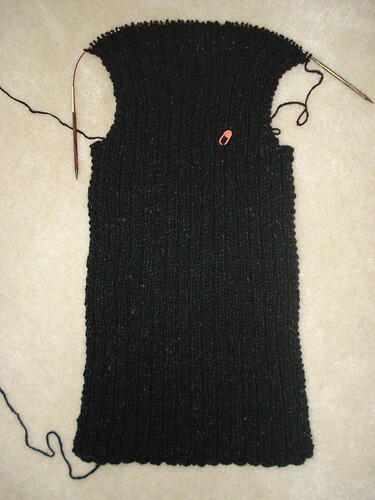 This way you could add to your length and knit the pieces of the vest to your own personal measurements. The pattern is written to work from 2 balls of yarn at once (the kit has two half weight skeins in it for you to work from). I would definitely do a gauge swatch and measure it before and after washing - this yarn relaxes and changes after washing. Last Saturday I got an envelope of yarn from a very nice knitter in New York. I've never met her but I know she's nice because she sent me the yarn I needed to finish my Celtic Vest. She didn't mock me for getting myself into this by changing the pattern and not assuming I would need more yarn, she just sent the yarn. Hooray for nice knitters! 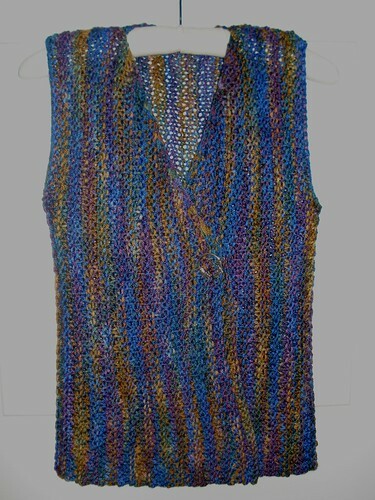 I sat down and knit the last two rows on the vest, bound it off, blocked it and sewed up the shoulder seams. IT'S DONE! I love the way it looks and I might just live in it this Fall. Fleece Artist Celtic Vest Kit from Colorsong Yarns in the Mermaid colorway. I added 10 extra stitches to the cast on, which gave me a finished length of 23 inches from shoulder to hem, but I had to go begging for yarn to finish it up. If I do this again, I'll only add 8 stitches to the cast on. I used my Knit Picks (the nickel plated ones - I get looser gauge in those than the wood ones)interchangeable needles in the 6.5mm size. The pattern calls for a 7.0mm needle which I don't have. This worked out well for me. Oh, and I know it doesn't really show up very well in the picture, but the pin I put on the vest is from R.E. Piland, it's the Dragon II Penannular. About a year ago (give or take), the Yarn Harlot blogged about a cardigan called Juno from one of the Rowan Fall books (Rowan 40). As soon as I saw it, I fell in love with it and promptly ran over to Janette's Rare Yarns and ordered some yarn and the book. (By the way, Janette is no longer an eBay store, she's got her own site.) I put the yarn away for a while, but over the weekend I cast on for Juno. After reading Ravelry notes on this sweater, it seems to move pretty quickly through the body (the whole body is ribbed) but then it slows way down for the collar. 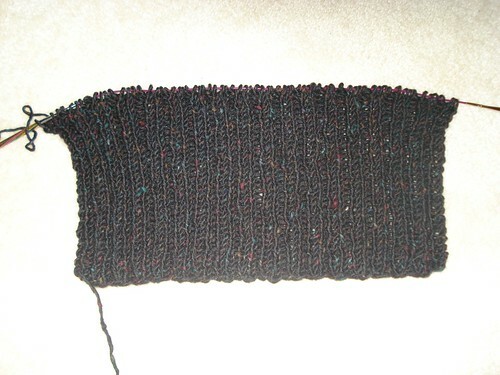 I like cables so even though the collar will be slower to knit, I think it will be fun. Introducing Water, the third pair of sock designs based on the classical elements. Once again, two designs based on a single element are combined in a single pattern purchase. One design is simple and easily memorized for portable knitting and the other design is more complex. Stitch patterns for both designs are in both charted and written out forms. The first design, Raindrops on the Window, is fast and easy. The stitch pattern depicts the patterns raindrops make as they run down a window, occasionally being swept sideways by a gust of wind, some of them dripping down alone, others joining with more raindrops and becoming bigger. 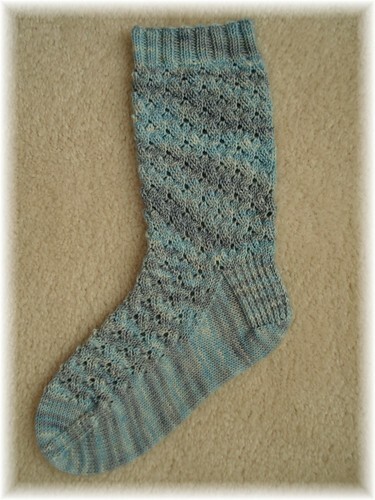 This design is fun to knit and will work up well in both solid and handpainted sock yarns. Shown in Blue Moon Fiber Arts Socks That Rock Lightweight in the Blue Moonstone colorway, knit at 8 stitches to the inch in stockinette stitch on US 1's (2.25mm). The second design dedicated to Water is Mountain Stream. Every Winter snow falls in the mountains and every Spring and Summer, as temperatures rise, the snow melts and runs down the mountain. It begins as a small trickle but soon forms streams. These streams occur every year, meandering downhill, around rocks and over the landscape, sparkling in the sunlight. Farther down the mountain the streams converge and become raging rivers, feeding lakes, providing water to the people and animals who live in the area, and entertaining rafters. This design, while more involved than the previous one, has a rhythm to it as the crossed stitches "flow" back and forth over the purled background. 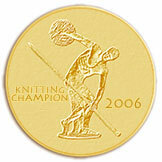 It will show to it's best advantage in solid or handdyed solid yarns. Shown in Apple Laine Apple Pie in the Deep Sea colorway, knit at 8 stitches to the inch in stockinette stitch on US 1's (2.25mm). I was trying to get the Water sock pattern finished up this week. I have knit and written the pattern for the easy design in the collection and I thought I had the more complex design going. I made it to the heel turn and decided that while the design worked with the water theme, it just wasn't as interesting as the complex designs for Earth and Fire are. So I frogged what I had, went back and did some more figuring, redesigned the complex water sock and started knitting the second version. I ended up frogging that one due to a problem with counting, but I can now say that I have a design I like, both the complex and the simple Water designs are at the same level as the Earth and Fire sock designs and I'm halfway down the leg on the new complex water sock. I will have the finished pattern ready sometime next week. The good news is I have already figured out and made notes on both designs for the Air socks, so those should be following the Water socks fairly quickly. I've enjoyed working on this series of sock designs and I think I'll do another series of sock designs at some point. Have you ever wanted to judge a knitting contest? The Lone Star State Knitters (that's Texas, ya'll) have put their projects on the web for anyone and everyone to vote for their favorite! It's fun to go peek at what other knitters are doing, so take a look and vote for your favorite if you want to! Click here for a link and click Design Contest in the sidebar to see this year's entries. 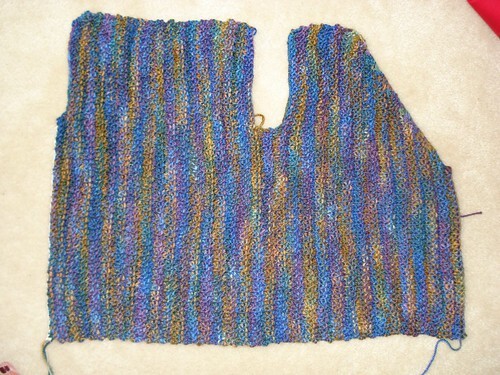 Where I am now: 2 rows and a bind off shy of finishing the vest. What I'm doing about it: If I need to, I will ask Fleece Artist to do another skein for me, but since I'm only 9-12 feet short of finishing (and that estimate is probably excessive), I'm going to wander around Ravelry and email people who have done this vest in the Mermaid colorway and beg for yarn, starting with those located closest to me geographically first. I'm waiting for a reply from a knitter in New York right now. The moral of the story: If you want to make your Celtic Vest longer, only add 8 stitches to the cast on for extra length. ETA: I just made a deal for a few more yards of this yarn in exchange for patterns! Yippee, I can finish my vest soon! Before I start babbling about my own knitting I need to remind everyone that Mystery Stole 4 will close signups at midnight tonight, Friday, September 12. (That's midnight MDT.) If you haven't signed up by then, you can't sign up for the KAL. If you do miss the signup cutoff, the pattern will be available at some point in the future for sale. OK, now that everyone has been reminded of that, I'll show you where I am on the Wabenschal. I haven't been knitting on it too much (been busy with stripes) but when I sit down and do a little bit on it, it really does go pretty quickly. I think that since it's extremely boring to watch a scarf/shawl grow, I'll only update this on the blog on Friday or if something really interesting happens with it. I like the lace design and I like the way it biases. It's pretty simple knitting and I can work on it in front of the TV so that's a good thing. I'm also working on finishing up the Water sock pattern and since I finished up the Basic Chic Hoodie, I'll probably cast on for something new this weekend. A while back, I think through one of the Mystery Stole KAL's, I met ClaireLeah who is another knitter here in the general Washington DC area. We would chat periodically when both of us were online at the same time and I met one of her friends at MDS&W one year, but as far as I know, ClaireLeah and I have never actually met in person - we know each other in a casual Internet kind of way. She is involved in a project for a charity called TAPS (Tragedy Assistance Program for Survivors). TAPS was founded in 1992 to support and assist those who had lost loved ones to military service. They were in Arlington, VA after September 11, 2001 to provide support for the families of those who died in service to America. They have conferences throughout the year in various parts of the country, but on Memorial Day every year, they have their main survivor conference as well as a Good Grief camp for kids here in the DC area. Or if you live in the Washington DC area, you can deliver it to Aylin's Woolgatherer, Uniquities, or Nature's Yarns. I think the bright colors I used in the stripes on my Basic Chic Hoodie would make a great Memory Pillow! And It Comes To A Screeching Halt! Yesterday I got the front band all done, complete with buttonholes, wove in all the ends and went to sew my buttons on, and - NOPE! The buttons I had planned on using didn't match the red color of the yarn. I have gone to Button Drawer and ordered some new buttons (as well as some emergency back up plain silver toned buttons) and now I will steam block the sweater and put it away until I can get buttons on it. For all intents and purposes however, I'm marking this sweater as "Done." By the way, I ended up needing 7 skeins of Red for this project (I just barely needed the 7th, but I did need it) and only one skein of Turquoise. 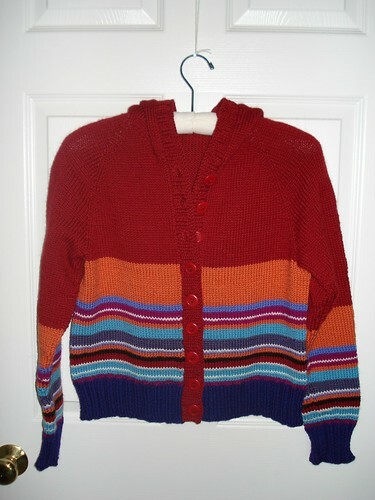 I will update the totals on its Ravelry page and when I do get the buttons on, I'll get a picture of it on. I'm SO using this pattern again! So I knit a hood for it! I finished the hood this morning so now all I have to do is the front band - I'm going to do it all in one band - add buttons, give it a good steaming and I have a sweater! I know I've said this everyother time I've blogged about this sweater, but seriously - this is a great pattern! I got a lot of knitting done this weekend and not only did I get both sleeves of my Basic Chic Hoodie done, but I got all the ends woven in and sewed up the seams! (I knit them flat instead of in the round because I thought that would work better with all the stripes.) As you can see in the picture above, I've started the hood now. 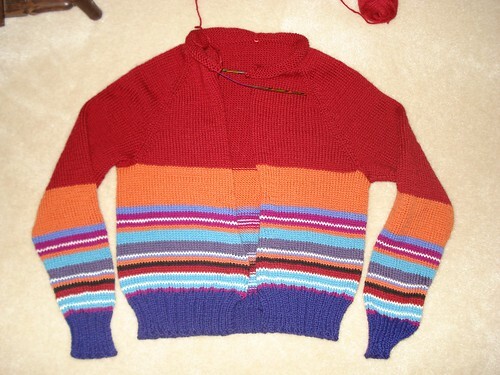 This sweater is really zipping right along (assuming I read the directions). I think it would be a good sweater for a beginner to knit. The pattern is well written and while it's a bit more involved than the standard beginner sweater (oversized, drop shouldered, shapeless blob), if you follow the directions and trust the pattern, you'll have a nice sweater that you'll actually want to wear. The pattern comes in a pretty big size range and the nice thing about hoodies is the hood draws your eye upward on the back, distracting from whatever junk you have in the trunk (and I don't care how small or big you are, we all have issues with that area). I hope to get this finished this week and I don't think that's going to be too much of a stretch. According to the Farmer's Almanac, we are supposed to have a REALLY cold winter this year and they're right 85% of the time - good thing I spent all summer knitting cardigans! Since all I have to show today is a bit of red sleeve (I'm not to the striping yet), I thought I'd tell you what changes I've made to the original stripe pattern to fit my gauge as well as give color numbers of the yarns I'm using. I'll also enter this into the Ravelry project page for this sweater so if you ever need this info, that will probably be the easiest way to find it rather than plowing through pages of Pink Lemon Babble. 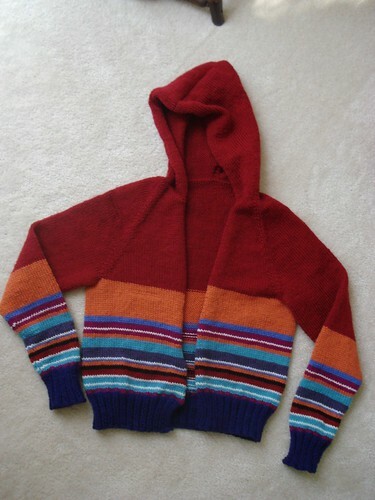 The pattern is the Basic Chic Hoodie from Bonne Marie. The stripe pattern came from the J. Roberts pullover (scroll down below the armwarmers for the original pattern). The yarn I'm using is Elann Peruvian Highland Wool in the worsted weight. 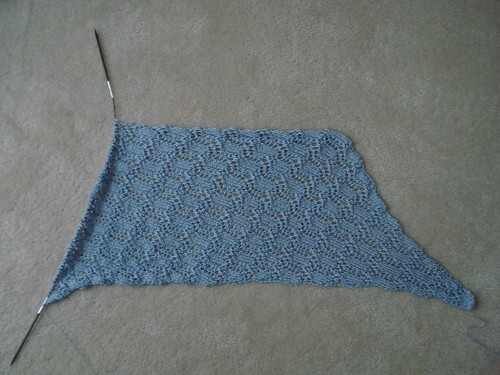 I'm getting 6 rows per inch in this yarn which is the correct row gauge for this pattern. The row gauge for the stripe pattern is 5 rows per inch. The original stripe pattern is 62 rows long, which at 5 rows per inch comes to about 12.5 inches. 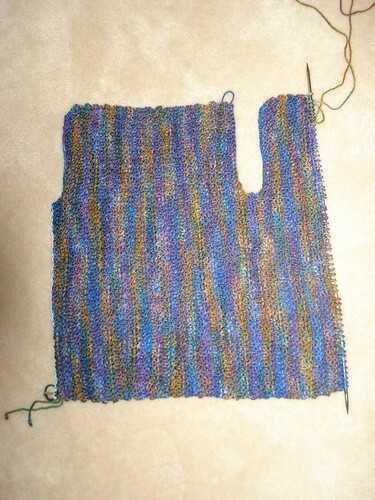 In my actual row gauge, if I knit the stripe pattern as written, it would be only 10.3 inches long. Since I really liked the look of the original stripe design, I needed to make some changes to the stripes to get that same look in my gauge. 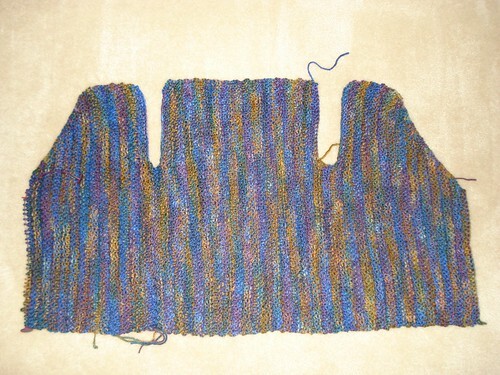 I figured that I needed to have a stripe section that was 75 rows instead of 62 rows, so I needed to add 13 rows. As luck would have it, the two stripes that would be most affected by the change in row gauge were the wide orange stripe at the top and the wide dark blue stripe at the bottom, so I decided to add the extra rows to those two stripes, making them about 3 inches wide, which was their approximate size in the original stripe design. OK, still with me? Here is the stripe pattern as I'm working it (to see the original stripe pattern, please see the above link). If you're working a larger size sweater you will definitely want to have more yarn, except for the Black and Cream - I think 1 ball of each of those will do just about any size. The Red I'm using is #2055 and it's a good, true red. I'm not sure how much I'll use of the Red - I bought 10 balls but I'm 99% sure it isn't going to take that much - I'll know when I'm done. So there it is, all the gory details about this sweater, if you care. I hope you have a great weekend! I've now finished the body of my Basic Chic Hoodie, the second time! This time around I didn't weave in a single end until I knew I had done it right. (Yes, last time every single yarn end was neatly woven in - had to unpick them as I frogged.) So right now I'm weaving in the ends. 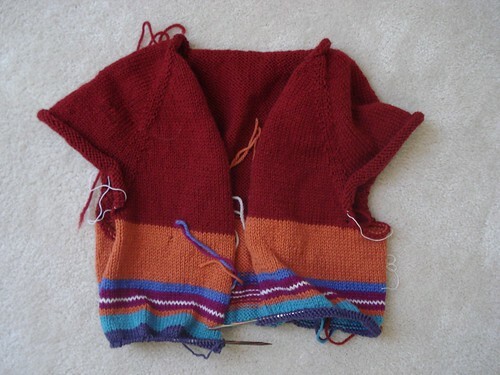 Then I will do the sleeves (I'm going to knit them flat because I think a seam will be neater than working in the round with all the yarn ends from the color changes), the hood and the front bands. I've already got the measurements and I have to work 42 rounds/rows of red before beginning the stripe sequence on the sleeves. The only real change I've made to the pattern (other than the stripes, which are more of an aesthetic change than a design change) is to skip the pockets and instead of working the lower rib for 4 inches, I started it on the second row of the dark blue, which makes it 3 inches. (By starting it on the second row of dark blue, I avoided having dots of magenta showing on the purl stitches-it just makes it look neater.) I'll work the sleeves the same way of course. I'm pretty excited about this sweater, despite knitting most of the body twice! It occurs to me (and I'm amused enough by the stripes that I might try it) that you could plug virtually any colorway into this sweater with these stripes (18 rows of A, 3 rows of B, 1 row of C, etc. and so on). I'm tempted to try an analogous colorway and see how it works - it would be a totally different look. Yes, that's right. I did nothing blogworthy yesterday! I have been working on the second design for the Water Sock pattern, but I'm not going to show that until I have the pattern finished. I do hope to get something done today that I can blog about tomorrow, but it might very well be a pile of folded towels (no, I wouldn't do that). I hope everyone has a great Wednesday! And I hope Caleb follows directions better than I do! 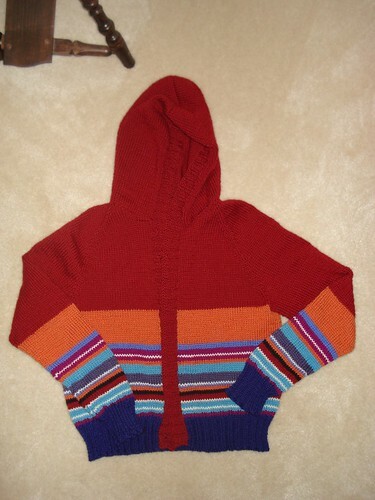 Last week I got quite a bit of work done on the Basic Chic Hoodie with stripes. 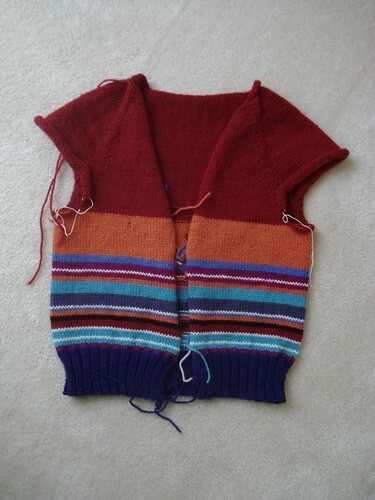 In fact, I got so much knitting done that I had actually finished the body and bound it off. Then I went to start the sleeves Saturday afternoon. I was very excited to start the sleeves because this hoodie just seemed to be flying off the needles (I am very amused by the stripes). So I started reading the directions and read something funny. According to the directions, I was supposed to be picking up X number of stitches that I had cast on at the underarm area when I put the sleeve stitches on a holder while I worked the body. I had cast on stitches in the underarm, but I had only cast on half of X. I double checked the directions and sure enough, there it was: cast on 1/2 X number of stitches, place marker, cast on 1/2 X number of stitches. I had only read the first part. The body of my hoodie was about 2-1/2 inches smaller than it was supposed to be. This was not the way I wanted it to fit. I tried it on, I mumbled about it, I thought about it, I wondered what could be done. Mickael pointed out that I could either fix it or throw it out, but at that point I had already fallen in love with the stripes and I really wanted to wear it. If I had just kept it the way it was, it wouldn't fit the way I had imagined and I wouldn't ever be happy with it. After much fussing and trying to get around it, I frogged the hoodie back to the armpits, cast on the RIGHT number of stitches this time and now I'm re-knitting the body. Here's where I am. I hope I've learned my lesson and will read the directions properly now.